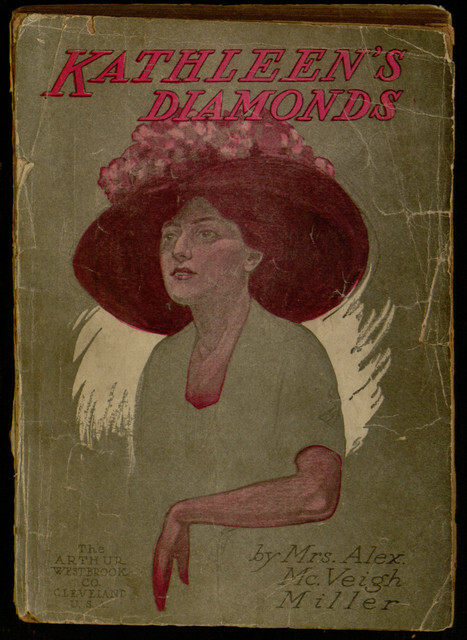 Hot on the heels of Little Golden’s Daughter comes another Mrs. Miller novel, Kathleen’s Diamonds; or, She Loved a Handsome Actor, which proved to be the most challenging of our eBook projects thus far. The challenge of this project came from the fact that, like many of Mrs. Miller’s works, this novel was first serialized in a story paper (in this case, the Fireside Companion), and later reprinted as a paper-covered book (in this case, from publisher Arthur Westbrook). Normally, it is easier to use the book as the source for creating an eBook, since all of the text can be found in a single volume. However, Westbrook was not always the most careful of publishers, and in the case of Kathleen’s Diamonds, the text contains errors that could not be resolved without consulting the story paper originals. Upon resolving those errors it was discovered that the reprint also omitted large amounts of poetry found in the original appearance of the story. For the sake of completeness, we determined to track down and restore all of the missing text. Finding the original poetry was quite a challenge, given the fragility of the story papers in our own collection and the scarcity of other copies. Fortunately, with the help of two private collectors and one other university library, we were able to obtain all of the lost verse and release what is likely the most complete version of the novel ever distributed. Was it worth the effort? Read the book and judge for yourself — if you enjoyed The Bride of the Tomb, you probably won’t be disappointed. It is available at Project Gutenberg for online reading or download in a variety of popular formats.